A long time ago in a galaxy far, far away, George Lucas added Space Fighters to the standard arsenal of SF warfare tropes. For Hollywood it was love at first flight, partly for the cool special effects, partly for the reason I gave here. At SFConsim-l the consensus has been trying to stuff the things back in the toy box for the last eight years ... but no one listens to us. Lucas did not invent space fighters, of course. I don't specifically recall any in the SF I read growing up, but I vividly remember one in an animated series I used to watch in grade school. (That was also a long, long time ago, and alas I have no idea what show it was.) Space fighters didn't really catch on till Lucas, though - the clearest evidence being that Trek had nothing of the sort. So ... what exactly is a space fighter, and what does SFConsim-l have against them? If Star Wars, Battlestar Galactica, and Babylon 5 are anything to go by, a space fighter is exactly what you would imagine: the spacegoing equivalent of a DeHavilland DH-4 or an F-16. It is a small spacecraft, about the size - and, oddly, roughly the shape - of a present-day fighter jet. It has a single pilot or at most a two-man crew, strapped into a cockpit with minimal habitability, clearly intended for short missions of only a day or so at most. We see them whooshing and gyrating across the screen, zapping away at each other. Now and then they also destroy the odd stray Death Star, which with typical bad-guy carelessness is designed to obliterate whole planets but cannot defend itself effectively against killer gnats. Space, first of all, is the same environment for small ships and big ones alike. This immediately knocks the stuffing out of the implicit contrast between small, fast fighters and big, slow space dreadnoughts. Fighter planes are airplanes; battleships are ships: They operate in two entirely different fluid mediums with very different properties. Battleships can't fly, and fighter jets can't cut power and drift while making repairs. There's no such essential difference between space fighters and larger ships - and no inherent reason for the fighter to be faster or more maneuverable. "Fast" is in fact a bit of a slippery concept when it comes to spacecraft. Speed in space is all relative to begin with; the more useful measure for a spaceship is delta v, "change in velocity" - especially, how much you can change your velocity before you run out of gas. For any given propulsion technology, the way to get more delta v isn't a more powerful engine but a bigger fuel tank. What a powerful engine does give you is higher acceleration - so you can achieve any given delta v more quickly. "Bigger fuel tank" and "more powerful engine" are also relative - to the size of the ship, more specifically its mass, since that's what you've got to push around. They are also contradictory in a sense - a big propellant supply means more the engine has to push around, so it is hard to get both sprightly maneuver performance (high acceleration) and extended maneuver capability (ample delta v) in the same ship. 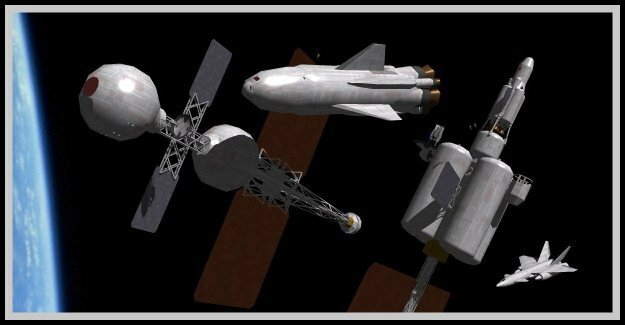 Which does suggest that a small, somewhat fighter-like spacecraft, designed for tactical operations with limited endurance, could be a good deal handier than big ships designed for long voyages. The short-range tactical ship - presumably transported to the battle zone by a "carrier," or operating from a nearby base - can carry a smaller and lighter fuel load relative to its size. It doesn't need the supplies, provisions, and life support of long-voyage ships - not even a proper zero-g toilet, let alone bunkrooms and a galley. (Also no crew of techs to keep it running: just a pilot.) The mass saved by leaving all of this out translates directly into higher acceleration: in tactical terms a more agile, "faster" ship. So isn't this our fighter, even if it doesn't look much like the Star Wars kind? If it's going to be a useful fighter, however, it should probably have an armament. It can't carry a very heavy one, or you lose the maneuver performance that is the fighter's reason for being. Nor can it carry much armor or other protection, for the same reason. Whatever armament and protection it does carry, however, should be sufficient to fight its enemy counterparts. If successful it destroys them or chases them off, after which it can attack bigger, slower enemy ships ... how? Broadly speaking, space warcraft in SF use two kinds of weapons. The more familiar are beam weapons - once called ray guns; now usually imagined as lasers or something similar. The hitch here is that our small fighter can't carry a very big one, especially since the weapon needs a power supply. Big, sluggish ships, by virtue of being big and sluggish, can carry a much heavier armament - heavy enough to zap a swarm of fighters out of the sky before the fighters can do much more than scratch the big ship's paint. Yes, the fighter is fast and maneuverable - but not faster than a laser beam. Nor is there much chance of jinking around to dodging one, at least at any range much less than Earth-Moon distance. Light travels that distance in one and a quarter seconds. Aiming is limited by the round trip (because the gunner depends on light, or a radar beam, etc., to see the target), so at Earth-Moon distance our fighter has two and a half seconds to dodge. That might be enough. But at a tenth of Earth-Moon distance - a piddly 40,000 kilometers - the fighter only has a quarter-second of dodge time. Dodging "bullets" that come at the speed of light is no way to live long and prosper. So if fortune favors the big battalions, combat between laser-armed warcraft favors big ships that can lay down powerful zaps. Maneuver hardly enters into it. Lasers and similar beam weapons, however, are not the only plausible space weapons. A throw pillow will wreck a space dreadnought, if you throw it fast enough, and spacecraft do go fast. Thus kinetic weapons, as described in this snippet back in April. The weapon itself is nothing more or less than a slug (or spray of slugs, like buckshot). It does, however, have to be thrown - fast and hard. One way to throw it is to shoot it out of a gun - probably electrical, a railgun or coilgun. This, however, requires a heavy, high-power installation. As with lasers, coilguns with serious hitting power thus require big ships to carry them and their power supply. Another way to throw a slug, however, is to put it on the front end of a missile. The launching ship has to carry the missile, but this requires nothing more than a launching box, or even a clamp on the side. The third way to deliver a kinetic slug is the simplest of all: Head toward the target, fast, release the slug - then veer aside before it hits. This last tactic has a lot in common with World War II dive bombing. In practice you would probably combine "bomb" and "missile" - the slug having a guidance motor to steer it into the target and counter any evasive moves on the target's part. Henry Cobb on SFConsim-l came up with the term lancer for this tactic and the ships used to execute it. In contrast to zapping with lasers or similar weapons, lancer tactics favor small, agile ships. You need good maneuver performance, first to line up on collision course with your target, then to veer clear of the target - and its defensive fire envelope - after releasing your ordnance. Large size is no advantage, because the lancer ship needs no powerful on-board equipment, and because several small lancer ships are preferable to one big one. They can engage several different targets - or come at one target from several directions, boxing it in. Now things start to look interesting, because it has probably already occurred to you that lancer ships can engage each other. In fact, if lancers are technically and tactically viable at all, the best way to protect your big ships from them might be to send your own lancers out to engage them. A battle between lancers even looks quite a bit like a dogfight, though on a vastly larger physical scale. We can imagine small, handy ships, hurtling along complex curved trajectories, trying to line up for clean shots at their enemies while avoiding getting lined up on - especially getting boxed in, where evading one enemy sends you right into the path of another. It's taken us long enough - I've been working on this post, off and on, for about three weeks (which is why this blog has looked like a dead zone lately) - but here at last we seem to have our space fighters. Not so fast: There are complications. In space, if I've lined up a good shot at you, you also have a good shot at me. We're heading straight at each other in a game of interplanetary chicken - given equal-performance ships, if one of us veers aside in time neither of us scores a hit; if not, we both score hits. In lancer combat you're either a live chicken or a dead duck. So much for swaggering lancer jocks knocking back green fuming Rigellian brandy and hitting on the bar girls. The simple if unromantic solution is to leave out the pilots, or at least put them back somewhere safe, "flying" the lancers by remote control. That way you're not throwing away pilots, just some expensive hardware. There's not much reason to have a pilot in any case. Outer space is a tactically "clean" environment, without much clutter - ideal for automated systems. A lancer ship would have to be flown mostly by computer anyway; there's really not much place for silk scarf and goggles. Save the mass of pilot, cockpit, and even minimal life support and your lancer-turned-drone becomes that much more agile. One type of decision that can't be left to an ordinary computer is a rules-of-engagement decision: shoot or don't shoot. In contemporary terms only a human being - or an artificial intelligence as sophisticated as a human being - can decide whether a car speeding toward a checkpoint carries a suicide bomber or a terrified Iraqi family. A tactical space battle, however, is very unlikely to pose that sort of question, at least in a form so immediate that it can't be decided by a human remote operator a few light-seconds away. You could find ways around all of these complications, but at some point it becomes special pleading - like contriving a world where people have radar and guided missiles, but fight their sea battles with ironclads, really just because it would be cool. A more robust contrivance is to have your ships fight in Z-space (or whatever you choose to call it), where the local laws of physics favor spaceships that fly like airplanes. It's still contrived, but not so baroque. For "normal" space, however - the kind with stars and planets - space fighters are a pretty dubious proposition, and you're better off without them. Of course, if Hollywood calls and waves some money in front of me ... space fighters you want, space fighters you get. Sixty-two years ago today - yesterday, for most of you reading this, since I live near the tail-end of time zones - the Enola Gay dropped a nuclear bomb on Hiroshima. Very roughly 100,000 people died: from the blast, then from the firestorm, and later from radiation. No one knows just how many, and while the death toll is still argued, "horrific" is sufficiently precise for most discussion. Amid the greater horror of World War II it was hardly a squib. The fire raid on Tokyo the previous March killed more than that; the bombing of Dresden a few weeks earlier nearly as many. The war as a whole provided several hundred Hiroshimas worth of senseless human destruction. Still the atom bomb (to use an old-fashioned phrase) stands out. There was and is something that catches the attention about an entire city reduced to rubble as far as the eye can see. So do a host of details. As a geek kid the images that chilled me most were the victims of whom nothing remained but their shadows, burned like photographic negatives onto surfaces behind them at the moment of the flash. I assumed they'd been vaporized, which they probably weren't (they'd have been luckier if they had been), but it is not an image you forget. In practical terms, though, what stood out about the atom bombs wasn't the sheer scale of destruction, but that it was wrought by a single bomb from a single plane. That is what turned all conventional military thinking on its head. Poor Alfred Nobel thought that high explosives would make war impossible, but dynamite, TNT, and the like only contain about ten times the destructive energy of plain old black powder, which which people had been cheerfully slaughtering each other for centuries. The primitive Hiroshima bomb released rather more than 1000 times its own mass in TNT equivalent energy, and by the 1950s the H-bomb improved on that by another factor of a thousand. Bismarck once said that the one thing you can't do with bayonets is sit on them. After Hiroshima, the major powers swiftly - and fortunately - realized that this is the only thing you can do with nuclear bombs. So long as you have one, any would-be attacker is restrained by the prospect of getting nuked. If you use it, you face the prospect of getting nuked in return. Nuclear defense is a non-starter, not because of all the technical problems of defending against ICBMs ("hitting a bullet with a bullet"), but because there's almost no dividing line between perfect and irrelevant. If I launch 1000 nukes at you and you stop 99 percent of them, you just kissed off ten cities. Hence the best acronym of the nuclear age: MAD, Mutually Assured Destruction. The World War II of military SF differs from the real one in one basic respect: It almost always seems to end on August 5, 1945. Even when SF geeks talk about weapons of annihilation, the favored techs are oddly roundabout - for example, the ever-popular changing of an asteroid's orbit so it smashes into a planet with dinosaur-killer force. Come on, guys 'n' gals, no need to get that complicated. If you want to slag a planet, just nuke the hell out of it. It isn't like people who know how to build starships are going to forget how to build nukes. In typical SF settings, where interplanetary/interstellar travel takes weeks or months, the thirty-minutes-till-Doomsday element of the Cold War may be absent, but the prospect of credible nuclear defense remains nearly as illusory. Yes, your defending space fleet can engage the attackers far off in space, but it won't be like a spacegoing Midway or Salamis, because the attacker can lose 99 percent of their strike force and still annihilate your homeworld with the remaining one percent. This makes traditional great-power warfare a pretty dubious proposition - which does not (alas) render it impossible, but does mean that such time-honored motivations as ambition and greed, or even folie de grandeur, don't quite stand up. Even foolish statesmen rarely make war without some semi-demi-plausible illusion of success. "We will cross through Belgium and reach Paris in weeks." "They'll greet us with flowers." Nuclear weapons make these illusions far harder to sustain. That leaves paranoia and outright dementia. Neither can be ruled out, sad to say, but they are not "politics by other means." They're merely beyond stupid. Nor is there even much story material in the scenario I outlined above - the heroic space admiral nearly wipes out the enemy fleet, but the remnants still wipe out her planet. It rarely makes for a great read, and the prospect for sequels is pretty much nil. I am not so optimistic as to suppose that the obsolescence of war means that everyone will join hands and sing "Kumbiya," or even pursue mutual understanding through dialogue as a solution to their differences. The last 62 years have provided substantial evidence to the contrary. However, the political use of force and violence may take different forms. We already see evidence of this. Since 1945 many more governments have been overthrown by their own army than by anyone else's, making armed forces a somewhat uncertain means of ensuring national security. Most recently we have learned that deterrence doesn't work against people who think that being incinerated is the crown of martyrdom. The Osamas of the world, however, are of limited utility to rational (or even semi-rational) power players. They are not particularly reliable tools - and if you give one a nuke and they use it, can you really count on conventional "plausible deniability" to protect you from nuclear retaliation? How lucky are you feeling? There might be something to be said for wars of assassins, a la Dune. Power players might be more disposed, if not to Kumbiya at least to mutual understanding through dialogue, if their own necks were on the line instead of just a lot of 19-year-olds and even more "collateral" victims. Really, mutual understanding through dialogue has a lot going for it. As Churchill said, jaw jaw jaw is better than war war war. If that still falls short, even a future era of coups, assassinations, and sporadic terrorist acts is an improvement on cities blasted to rubble, and populations that leave no mark of their passing but shadows burned into the streets. * I try not to be political here, but let's get real. As things are now, if you were the Iranians, wouldn't you want a few nukes?